It’s been a while! After more than a year, I finally have the spirit to update my website. Back with AdventureNotes as I have been inspired by travel vloggers. This is a trip that I did in 2016 during spring. And again, it’s London! London is a city that I visited – and would like to visit – over and over again. Yes, you can’t get enough of it. This time, I went to London because of visa stuffs. I wanted to apply for a schengen visa for my trip later to Spain. My husband and I decided to stay in London for a few nights just because we wouldn’t want to miss spending days visiting places in London. We went, I think, in around April/May. Having a trip in Spring is perfect because the weather is nice, the flowers are blooming, and the day is neither too short nor too long. We decided that on our first day, we will visit Greenwich area. Who don’t know Greenwich? I think it is a vocabulary that you will come across at school. That is the place where the 0 longitude lies. It is located rather in the south east of the City of London, and you can take the DLR or tube to get there. From central London, you will pass so many modern office buildings, which is really nice and also different from the old-style London touristy places. There’s also other alternatives, such as bus and cable car. Yes, if you are interested, you can take the Emirates Cable Car to cross the River Thames and get to Greenwich area. Getting down in Cutty Shark station, you can walk straight to the Greenwich Royal Observatory. However, we wanted to take a longer route and went near the river instead. We walked to Cutty Shark, which is a kind of monument made of a real ship. You can come into the place with a certain fee. However, my main goal was to go to the Royal Observatory. Therefore, we skipped that and walked along the street to the Greenwich Pier. From the river bank, we can go inside the University of Greenwich area. 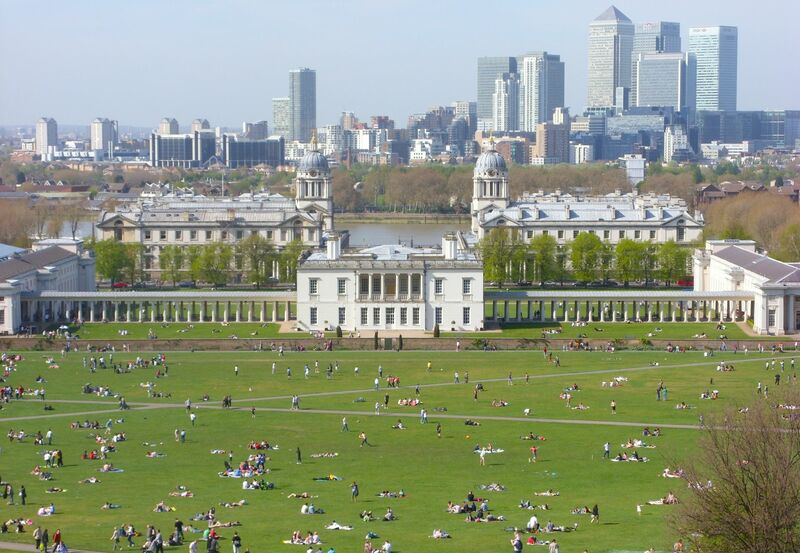 The most popular view from the University of Greenwich is its Old Royal Naval College building. It is a part of the Maritime Greenwich, which is a UNESCO World Heritage site (I just knew this!). We didn’t come inside as we don’t have that much time – and part of the complex is not open for public. We walked through to the National Maritime Museum to get access to the Greenwich Royal Observatory complex. Greenwich Royal Observatory is actually located within the Greenwich Park. We needed to walk through quite elevated road to get there. It was around 10-15 minutes walk from the National Maritime Museum, crossing the park. It was a fun walk and up there, not even inside the Royal Observatory, you can see a beautiful view of the Old Royal Naval College and the River Thames. It was not cheap, but for the sake of fulfilling our curiosity, my husband and I decided to splurge on some more money to get inside the Greenwich Royal Observatory. The ticket price is 10 per person for adult. We got in and explored the complex. The Greenwich Royal Observatory consists of several buildings. We can come inside each building and go up to the observatory. The visit was educational and the highlight was the Prime Meridian. There is a planetarium as well there, but we didn’t have a chance to visit it (extra fee!). Finished with the visit to Royal Observatory, we opted to visit the National Maritime Museum. It was an unplanned visit, but we got attracted by the whole exhibition in the museum. As most museums in the UK, the visit to this museum is free of charge (except for the special exhibition). There are so many things to see and there is also a great children area. We went around and fully covered the whole exhibition before going out to see the Greenwich Market. Greenwich Market is a so-called historic market in London. The area is full of small shops, selling many things from clothes to crafts. There are also food stalls there. At the time we visited the place, it was very crowded, with so many people queueing for food. The price of the food ranges from GBP 5-10. We decided to have a little snacks before leaving the market as we planned to have lunch elsewhere. The rest of the day was spent to eat lunch (this best eating spot – at least for us – in London called Noodle Stop near Piccadilly) and to meet friends. Tired with all of the luggage and everything, we ended our day by resting in our pre-booked hotel room. Again, we chose to stay in Easyhotel. It is a hotel chain that has properties in many cities and it always has a great offers. The first time we were in London, we stayed in Easyhotel Victoria with only GBP 25 per night. This was such a deal – keeping in mind that it was Christmas and holiday season! This time, we booked a room in Easyhotel South Kensington. We chose this place because it is close to tube station and many attractions. We paid GBP 38 for a night and we stayed for 3 nights. The room was super small, but it is enough if you really want to spend the days travelling and visiting places and only use the room to rest. What prime is its location with Easyhotel. All super central and really close to everything. We went out pretty early in the morning to apply for Schengen Visa. We finished quite early, around 10 am. We got back to the hotel to put documents away and planned out itinerary for the day. We originally wanted to visit the Natural History Museum, which is very close to our hotel. However, the queue was super long, reaching to the underground station. We skipped that plan and opted to walk to the Knightsbridge area. There are mostly shops and shopping mall in Knightsbridge – yes, Harrods is there. We didn’t spend too much time there and decided to visit another museum in London. We went to the Museum of London. It was such an interesting museum with loads of information, mostly about London. The exhibition areas are divided based on era, starting from the ice age to the current modern days. I got to learn about the London great fire, how it was in the Victorian age, and how it is today. Cool. After that, we searched for interesting places near the museum. Finally, we found that Leadenhall Market is not too far away. On this day, we chose to go around by bus as we have plenty of time. We got off the bus a bit far from the market as we wanted to explore the surrounding area. We walked pass the Bank of England (they have a museum, too! ), London Troops War Memorial, and Social Stock Exchange. The Leadenhall Market is not too far from there. What do we do in the market? Well, in my opinion, it is mostly about the architecture. It is unique and I think one of a kind. There are shops and restaurants, but not too much of a choice. After exploring the whole market, we hopped on a bus and basically just wandered around London, going where the bus took us. We went back to our hotel area and tried to explore the neighborhood. South Kensington is a quite famous neighborhood in London. It is known as one of the most exclusive real estate area and the buildings are really nice. We particularly were interested in the small shops around the Natural History Museum. There is this small bookshop with amazing collection. I couldn’t stop myself and bought quite a lot of books! Yes, the next day’s travel back to Birmingham would be heavy. This was our last day in London (and now I know that it was our last visit during our year in the UK). We only had the morning as our train leaves at 2.00 pm. After having breakfast in the hotel (nah, we bought our own food), we checked out and went to visit Camden area. I’ve always wanted to know the area since I watched this movie when I was in middle school. Now I already forgot the movie, but I’ve always wanted to go there. So this day was THE day. Camden Market is located rather in the north of London. It was a huge complex with many crafts and food stalls. What they sell in the market is similar from one to another, and coming from Indonesia (where the crafts are beautiful), I didn’t really find an interesting stuff here. What was tempting was the food. There are so many food stalls with so many choices. There are foods from all around the world, I guess. However, it was nowhere near lunchtime and we were still full. We just walked around the market and the area. Again, we decided to take the bus back home. What interesting was that there are so many shops too outside the market. The road was just full with sellers, many of those sell London souvenirs. People say that the souvenirs here are quite a bargain and lots of tourists come here to buy gifts for their loved ones at home. Overall, it was such a relaxing and fun visit to London. We didn’t have that much in our itinerary, but for me, it was more enjoyable. Well, again, it was not enough. I don’t know how much more visit that I have to make to London until I see the whole thing. Anyways, see you next time, London! Camden and Greenwich are both super nice!